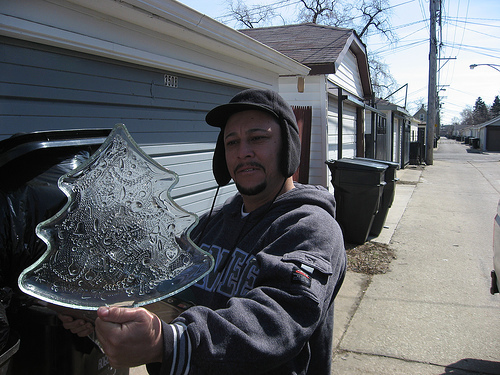 Gapers Block has been following the progress of Scrappers, a feature-length documentary film about laborers who collect scrap metal on the streets of Chicago, since it was filming in 2008. Since then, the film wrapped up production and premiered at well-attended sessions at the Chicago Underground Film Festival, where it won the Best Documentary Feature and Audience Awards. The Scrappers premiere at the Chicago Underground Film Festival. Photograph by David Schalliol. Following that success, the Gene Siskel Film Center invited Scrappers for an upcoming theatrical run from October 8-14. Co-directors Brian Ashby, Ben Kolak and Courtney Prokopas will participate in a question and answer session following the October 8 and October 14 screenings, while Editor Aaron Wickenden and Composer Frank Rosaly will join the three during the former session. GB's David Schalliol conducted an interview with the co-directors in advance of the theatrical screenings to get a better sense of their approach, process and what they learned from the film. What was the initial intention and scope of the film? Ben Kolak: While an undergrad at the University of Chicago, I often watched scrap metal collectors in the alleys. While initially drawn to the spectacular manner by which they precariously loaded their trucks and shopping carts with all sorts of consumer items and construction debris, upon further reflection I thought the profession could provide a convergence point for portraying Chicago's post-industrial landscape and the city's working poor. So the intent at the start was to make a lyrical vérité documentary - I was deeply influenced by the city symphony tradition, as well as the work of Jean Rouch and of Kartemquin Films here in Chicago. I made a short film about shopping cart scrappers in Scott Wolniak's video art class that was well-received and not too difficult to produce, so I figured it was both a possible and engaging subject. After graduating in 2006, I hooked up with Brian and Courtney and we began hanging out at scrap yards, mainly Family Recycling in Pilsen and Cicero Metal in Cicero, getting to know all sorts of scrappers. By the spring we had hooked up with Oscar and Otis, I was able to buy a camera and sound gear, and we were on our way. Our plan was to keep shooting with scrappers and their families until we felt like we had captured anything and everything interesting about them - we were really thinking of the film as a portrait rather than a narrative. We had no deadlines, no agenda, we just wanted to see what might emerge. Four years later, we still feel like we've only scratched the surface. Brian Ashby: I didn't have any particular intention for the scope or structure of the film at all when we started, because I was right out of college and just wanted to get into something interesting. Obviously that changed later. We decided together early on about a few things, namely making the film feature-length and character-driven, and scoring it with musicians from the Chicago improvised music scene, all of which we stuck to. But otherwise, that lack of direction was probably our greatest asset. How does the film differ from what you thought you were setting out to make? BK: We hooked up in 2008 with Aaron Wickenden, an editor with years of experience at Kartemquin who forced us to structure the film as a narrative, which in retrospect, I think was the right approach as it helps make the documentation a lot more accessible and therefore seen by more audiences. I still see narrative as public enemy number one in the culture industry's blind campaign of mass delusion and exploitation, but at the same time feel that the slower pacing, ambiguity and unglamorous subject matter of Scrappers do real work towards opening up new possibilities for how our audiences might relate to their neighbors, their city, and the cinema. Who was the audience(s) for which you made Scrappers? Do you think the film resonates differently with different audiences? BK: Since I was engaged by scrappers, I figured other Chicagoans of my demographic would be as well, which I would describe as college students or adults new to the city, who, by virtue of coming to Chicago rather than a place like Naperville are probably tolerant if not highly interested in all things urban and gritty. So I thought the image of the scrap truck could serve as a hook to get audiences considering both social issues facing the working poor, as well as Chicago's unique landscape. We definitely had a cinephile audience in mind, wanting to try our hands at working in the vérité and lyrical documentary traditions. When we looked into finding grant support, we began thinking about if and how our approach might work as an educational piece, as an example of street-level economics and ethnography, and in retrospect, I think that our film works best in the classroom. We've had some incredible screenings and discussions at places like Walter Payton High School and LaSalle Academy. The fluctuation of metal prices influenced the arc of the story in ways no one could have anticipated. How did you deal with that dramatic change while filming? Did other external factors influence the project that you were unable to incorporate into the film? BA: It was more than a fluctuation -- the prices disappeared, over a single night, for macroeconomic reasons that I still find difficult to comprehend. Of course it gave us unavoidable fodder for the plot, but it definitely didn't make the process any easier. The two families found themselves in strange circumstances, and our relationships with them grew a lot closer. Mostly it forced us to shoot for another (third) year. People at the scrapyards also became more willing to talk all of the sudden, as they were baffled by what had just happened to them. All kinds of other things happened, mostly personal crises in the lives of the two families. Sometimes we were unable to include those developments, but in most cases we chose not to -- there's more than a few in it already, and dealing with how to represent them is a thorny task. Scrappers could have been simply about the work life of scrap metal collectors. Why did you choose to follow your subjects' personal lives in addition to their work lives? Courtney Prokopas: Scrappers and scrap trucks are ubiquitous characters in Chicago's urban fabric and we wanted to give complete insight not only into what they do, but who they are. I think that many Chicagoans don't question when a piece of metal they place in their alley disappears in a matter of minutes, and they also don't think twice about who took that metal and where it's going. We began by filming Oscar and Otis working, but within literally hours we were welcomed into their homes. It is clear that their family is their major motivations for why they do what they do, meaning collect scrap. To not show this aspect would be turning a blind eye to the largest part of these men's lives. You followed your subjects during the night and day, in winter and summer, in the street and the home. How did you prepare for filming the project across such a broad range of situations? CP: Filming in the multitude of situations really challenged our creativity and flexibility. There's nothing like scaling a 15-foot pile of precariously piled junk to get the perfect shot. Holding the camera steady and adjusting focus in subzero temperatures was trying, but knowing that we would be rewarded with a big bowl of one of Luisa's soups was inspiration enough to stay out there on those long, cold days. Improvising our rig for tracking shots was really fun -- we ratchet-strapped a high hat to the top of a minivan and drove behind or in front of our subjects. Really, we just prepared to roll with the punches. Even more, you take the viewer into areas the scrappers never go, such as the inner offices of metal recyclers and political meetings. Is there anywhere you wanted to go but couldn't? BA: We found a representative example of every type of facility and character that we wanted, by following lots and lots of chance connections. But where to start with a list of slammed doors? Multinational conglomerate scrapyards, the place where Metra trains go to die, scrap industry trade conventions, barges down the Mississippi, container ships to China, Honduras (Oscar's home country). While the film is obviously about scrappers in Chicago, you chose to avoid dwelling on the location of the film. Why did you take that approach? BK: Our gesture with respect to the location was that Chicago's landscape is interesting because it is so banal - so flat, so straight, so structured. And this banality leaves room for interesting lifestyles, cultures and characters to emerge. We figured the best way to really capture the location would be to focus on the characters that it makes possible. BA: It dwells in the location instead of on it. Even so, what did you learn about Chicago through the project? How about through the subjects' eyes? BA: I learned a little about how people manage to live in it. More importantly, I learned how to make a film about Chicago, an activity historically practiced by only a small subset of humanity, and one which I intend to continue. Plus a few facts about parking regulations. I'm not qualified to say what the subjects saw through their eyes, but what I learned from them was deep and didn't have to do with where to find scrap metal. And, for fun: What was your favorite thing found in the trash while shooting? CP: Mike Olive's facility, Premier Metals, is a treasure trove! We found mangled brass instruments, hundreds of old Chicago street signs, misprinted grave placards, the sides of speedboats and carnival rides, so many wonderful things. I still have a few odds and ends around my home, like the imprinted plates from an old press -- the one with a really grumpy looking fat-cat type bureaucrat is my favorite. Scrappers will run at the Gene Siskel FIlm Center during October 8-14. If you can't make the screenings, the first edition DVD is for sale on the film's website. I'm glad to see artists making films about Chicago. It's a city that belongs on the screen. Scrappers is also available at Golden Age in the West Loop.